Next time you go anywhere where there is sand, scoop some up and count each and every single grain of sand you hold in your hand. Then try to figure out how many more scoops it would take for you to count all the sand in front of you, whether you're at the beach, a desert, or even a playground sandbox. After that, try to imagine how many grains of sand you would have if you added all the sand in the world, not just the sand you see where you now are but all the sand in all the beaches of the world, all the playground sandboxes, all the deserts...yes, even including the Sahara Desert! Now take that monster number of sand grains and multiply it by 10 and you won't even come close to the actual number of stars in our universe. All you'll do is come close to the number of stars we presently guess we can see with the telescopes available. 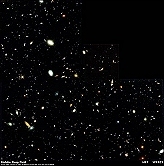 Dr Simon Driver, of the Australian National University Research School of Astronomy and Astrophysics has guessed at the number of stars we can see...and can only guess some more at the ones we're not seeing. Wow! Can you imagine that? It's almost impossible to try to understand the number of stars in the known universe, let alone the part of the universe we have yet to explore. Makes us wish the Enterprise was real...then we'd go warp speed through the galaxies to infinite number of places. We hope some of you reading this would want to learn more and explore the cosmos as you grow up! ...maybe even help Dr. Driver as he keeps counting the stars.